Sponsors. We love them. I got out my wallet to pay for a glass of white wine at the Tin Pan South Festival’s kick-off party on Monday evening (April 1). “It’s an open bar,” said the server. “Isn’t that nice?” I replied. “I love this party,” I thought silently. The good folks at Jack Daniel’s provided the bar. Thank-you, sponsor. Next, I headed to the buffet table. That’s where they had helpings of meatballs in marinara sauce, chicken pesto sliders, veggies, cheeses, pork sliders and skewers holding Genoa salami, sweet gherkin morsels and grape tomatoes. These were courtesy of Maggiano’s Little Italy. Thank-you, another sponsor. The event was staged in the Region’s Bank lobby at the Roundabout Plaza. Parking fees in the adjacent garage were waived. There’s another sponsor to thank. Hostess-with-the-mostest Lisa Harless swanned through a crowd that included such swells as Wood Newton, Liz Hengber, Bernie Nelson, Sam Tate, Jerry Foster, Steve Bogard, Jeff Silbar, Jon Weisberger, Richard Fagan and James Dean Hicks, not to mention Mike Sebastian, Mike Sisted, Charles Dorris, Charles Alexander, Charlie Monk, Mark Ford, Hank Adam Locklin, Chris Keaton, Alan Mayor, Susan Myers, Sherrill Blackmon, Jerry Vandiver, Ralph Murphy, Kayla Becker and Bart Herbison. 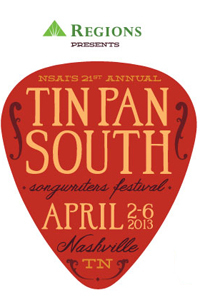 Tin Pan South showcases begin this evening (April 2). It’s a banquet of songwriting stars during the next five nights. Participating venues include 3rd & Lindsley, Belcourt Taps & Tapas, Douglas Corner, The Station Inn, The Bluebird Café, The Commodore Grille, The Listening Room Café, The Rutledge and Winners Bar & Grill. Expect to enjoy Jake Owen, Radney Foster, Bruce Robison, Rhett Walker, Rob Crosby, Tracy Lawrence, Joanna Smith, Joey + Rory, Danielle Peck, Tim Nichols, Derric Ruttan, Tiffany, Dave Barnes, Jim Brickman, Richie McDonald, Victoria Shaw, Brett Eldridge, Mando Saenz, Jim Femino, Earl Bud Lee, Shawn Camp, Lauren Lucas, Jeffrey Steele, Jon Randall, Sherrie Austin, A.J. Masters, Linda Davis, Jim McBride, Jay Knowles, Roxie Dean, Jimmy Stewart, Ashley Monroe, Trent Willmon, Mindy Smith, Daniel Tashian & Kate York, Michael Martin Murphy, Jim Lauderdale, Brice Long, Lance Miller, Dave Berg, Sarah Buxton, Joel Crouse, Rebecca Lynn Howard, Trey Bruce, Jessi Alexander, Kerry Kurt Phillips, Brian White, Carolyn Dawn Johnson, Michael Peterson, Mark Selby, Kacey Musgraves (miss her at your peril), Sonny LeMaire, Mark Nesler, James Otto, Lee Roy Parnell, Gary Nicholson, Larry Gatlin, Leslie Satcher, Trent Summar, Marcus Hummon, Kim Parent, Jeff Black, Sam Bush, Kim Richey, Skip Ewing, Even Stevens, Lari White, Lionel Cartwright, Becky Hobbs, Judy Rodman, Casey Beathard, Phil O’Donnell, Cary Barlowe, Dave Gibson, Irene Kelley, John Wiggins, Tommy Sims, Billy Montana, Frank Myers, Eddy Raven, Tom Kimmel, Jerry Salley, Carl Jackson, Gordon Kennedy, Karen Staley, Casey Kelly, Jonathan Singleton, J.D. Souther, Big Al Anderson, Steven Dale Jones, Walt Aldridge, Gabe Dixon, Amy Grant, Tom Douglas, Tony Lane, Lee Thomas Miller, Wynn Varble, Matthew Perryman Jones, Buddy Jewell, Billy Yates, Jimmy Fortune, Shelly Fairchild and many, many more. Scattered throughout the five-day schedule are such Nashville Songwriters Hall of Fame members as Allen Shamblin, Paul Overstreet, Dennis Morgan, Pat Alger, Mike Reid, Mark D. Sanders, Dean Dillon, Gary Burr, Bob DiPiero, Richard Leigh, Matraca Berg, Hugh Prestwood and the aforementioned Jerry Foster.